Dark Wolf: Tomasz, thank you for the opportunity of this interview. Which is your first memory about art? What made you grab a pencil or a brush for the first time? Tomasz Jedruszek: Can’t tell really. I believe the art was always somehow present in our house, my aunt did paint and my uncle too. Grandfather was coloring old photos etc. But to think about drawing something seriously I did after I get my first comic album from my father, who was a great fan of comics already. Dark Wolf: I’ve seen that your works have subjects from different areas, fantasy, science-fiction, mythology, history. Which one is the most inspirational for you and which one is your favorite? 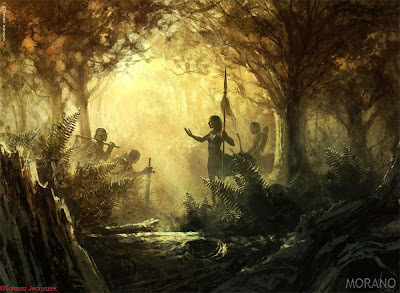 Tomasz Jedruszek: I’m not doing any top list or classification of my work, I paint what I have assigned as freelance job - and I threat this as a good part of my job , it surprises me , even I know the game, AGOT for example, the new art set is always a great mystery to me. This is very challenging also so I never get bored with my work. While painting for myself, fun etc I just choose my subject according to my current mood or just an idea I have at the moment or kept in my mind for some time. Since I have very little of free time, sometimes it happens I hold an idea for couple months before I actually paint it. But I understand you still would like to hear which one I prefer the most -well I like to paint humans in general, of course an anatomy is really test, but I do also pay lot of attention to emotions of my characters, that’s why I think this subject is most interesting, from one point it is a search of physical perfection, from the other it is to putting a live in it... sounds little like God's play but hey, this is what we doing here, we are not copy the nature, just creating it from scratch basing on references. 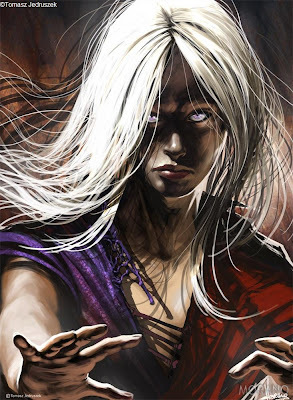 Dark Wolf: Speaking of fantasy, do you enjoy fantasy literature? Tomasz Jedruszek: I did, but I cannot remember when I read any of books, not to mention if it was fantasy. Ok, it is not that bad, I do read a little but not that much as I wish. I remember one of my first fantasy books (at my 10 as I remember) was "Nine princes of Amber" by Roger Zelazny which brought me to totally different world and I just loved that feel - later I did read lot of similar books, but it was harder and harder to feel that magic again, I do not know if that was because I get older or the books were not good enough. Still hoping I will find some book again which will open its gate to another dimension for me. DW: One of my favorite authors is Henryk Sienkiewicz. Did you ever find inspiration in his novels or paint some scenes of them? TJ: Probably, but I think I am doing it almost automatically already - you see Sienkiewicz is one of our (Polish) writes of all times, we have to read his books in school we watch his books adaptations every Christmas on TV (I am serious, can't imagine holydays without "Potop" on TV). His books, those most popular, so happening in XV or XVII century, are containing lot of patriot, nostalgic elements, battalistic scenes and lovely descriptions of Polish country. Characters are very deeply created. 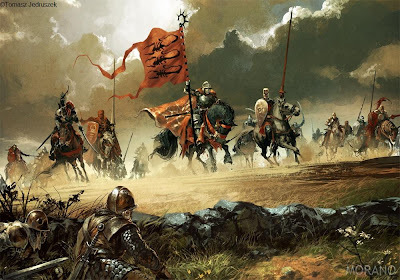 So obviously I do paint lot of charging cavalry and clashing knights and thinking somewhere back of my head about all those scenes from Sienkiewicz's books because it is very good stuff, sure. DW: One subject I remarked at your works pictures a post-apocalyptic world. Do you think that our world has such a grim future? - but in “West Trading Company”: “They started to build their "company" last year. We were all surprised how fast they growing strong, organized. Now they are building fleet, they have weapons and they are fighting back. And the most important... they found the way to breed again." - I also put some hope in reader's heart, I even pointed some clues how to achieve better future, I think we still can survive if we just hold tight together as one. DW: I saw that some of your paintings are inspired by songs. How does music inspire you? TJ: A lot :) I actually cannot imagine my work without music. What is interesting I do not care much about music type to be suitable to art subject - for example if I paint blood lust monster It doesn't have to be "Slayer" or "Sepultura" sound track behind it, as a matter of fact the monster will be much more creepy look like if I have some classic music in my ears. But there are also subjects which has almost constant playlist, for example my AGOT work it is most probably made listening "Mind Gate" or "Lao Che" both are Polish bands. My last work "Angel" for example was made with listening Jana Todorovic, a briliant voice of Serbian pop singer. I rather do not seek an inspiration in meaning of lyrics, I like to make my own "story" to particular music atmosphere. Years ago I made a video clip placing Chemical Brothers track on "Joan D'Arc" movie by Besson. The lyrics and beat had nothing to do with medieval subject but the end result is pretty cool. DW: One of my favorite works of yours is that dedicated to Glen. Do you believe that one image can do more than a thousand words? TJ: Oh, I would never say something like that about any of my work. I believe an image can really do that but that must be brilliance in its brilliance. If you think „In the possession of green water" can really tell how I suffer that lose of Glen Angus then I am glad you are saying it. Maybe I will tell more about that story, the image concept was to paint Neida few years older when bad effects of being addicted to green water has changed her in a beautiful but deadly woman. Few moments before posting it this striking news came on me, and I was shocked. I barely knew Glen as a person, I was just a great fan of his work, and I believe I just post few times under his works and so did he under mine, we wasn't definitely close friends is what I am saying. But once I realize he's gone I realize I would never ever see his work posting on CGSociety again, so I put in this illustration description also, that we cannot appreciate someone's presence till he's gone, but then it is already too late. What is even worst we are all about to forget about those people gone pretty fast. That’s why I decided to keep my "grey scale” artwork dedicated for Glen as my default picture, forever as long my account stays on CGSociety. DW: You were impressed by words one time and made a painting for a fan after reading his letter. Would you do it again? What should the letter sound like to impress you again? TJ: I could quote that letter here so you could tell by yourself, but I would rather not, I have no permission to do that and the letter was full of love. Not to me :) but that guy to his wonderful girl. I am not that romantic as you might think but as I just said to him, I really like that he has courage to tell some strange artist about his deepest feelings and there was so much honesty in it, it is really rare these days to meet someone who isn’t afraid to talk about his feelings, I really respect that. So if someone would ask me about do that kind of thing again I probably will. I won’t tell you directly what should be in the letter to make me work on your Valentine portrait for your beloved girl, I just say I respect life, humanity, culture and intelligence, I always enjoy talking or working with smart, honest and good people, some silly things like money are no important then. DW: I’ve seen a number of self-portraits, each one picturing you in different roles. Do you enjoy making these works and the transformations you suffer in your works? TJ: I do, a lot :D But they were more like jokes you know. Mostly they are regular freelance characters just typed in description that is me because some of that vampires or monsters are reminders of me a little or they are just characters made for client and then I worked on them little more with beer in my hand, just for fun. And if they look little like me, well I guess most of artist do that put some their own personality in their characters... or backwards, they are painting characters that look as their best dream. My brother has a theory that every girl I painted looks as our mother, not straight, but there are some spots which reminds my mother personality, smile, corners of the lips or eyes, or hair, you know brother will spot that thing immediately :) So there is possibility most of my male characters contains some self-portrait elements, but as I said I enjoy it because I have lot of distance to myself and allow sometimes making jokes of me. DW: Which plans or projects do you have for the future? TJ: I hope I finally would find some time to finish my Venhelis project. But honestly I think about little break, I had lot of work recently, plus I have more duties now since I become husband and a father so it is most probably I will gone for a while. Congratulations and thank you for your answers and amiability. 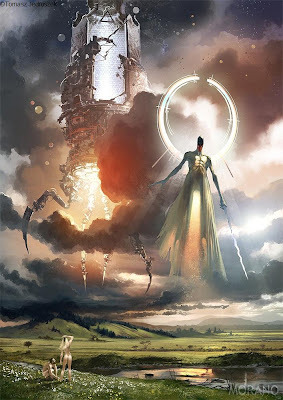 For a full portfolio and other information about Tomasz Jedruszek please visit his website, Morano.pl. i love this series of intervews you're doing. and the choice of the artists featured is great too. congrats, wolf! And I'm happy you enjoy these articles. I'm aspirant for greatest Degital Artist and I found your magnific blog today. Can you see my english? I don't have confidance yet. Cause I doesn't adapted with english yet. (I'm korean. :D) Anyway, I would visit this awesome blog everyday. These blog make my desire both what learning for english and take the Artwork information. Anyway, You may will find my name after few years in Cgsociety and so on. And then, If anyone try interview with me, I'll answer to them "Dark Wolf's were cheering to my inspiration". -_-; Hey, ....Would you... show the polish my sentence? I need the more vocabulary. This is almost my first contact with native english user. Since on present time, I were only read and refer from english site. Every first step has make the big tension to shy. I want confirm my english, can I send my meaning to world wide peoples? I want really realrize it. help me T_T Dark Wolf who my Inspirance suppoter. Oh my god My my god oh my god!!!! He rpply to my commant!!! OH my god!! Could he understand my pool english!!? OH god. Great. It's awesome already! I'm on visit your blog today and would get the great inspiration again! How can I see your profil? I want know about who you are! Anyway, I would start the catching new inspiration. I'm on learning english with gaming too like you. Even I can't doing it(cause I'm korean. I have military duty), But after done of this duty, I would keep my gaming what "Longest Journey : Dreamfall". that is Awesome game! greatest story line, and visure, and also varietical nuance of English appearing with time streaming. You may turn my mento. anyway, you are first people who is English people I contected. Be Honestly, You seems like Alien to me 8-)(!). or you are totally another gellaxy's organism!!! (-_-; sorry) I will learn different culture with in this blog and have adapt with your mind. 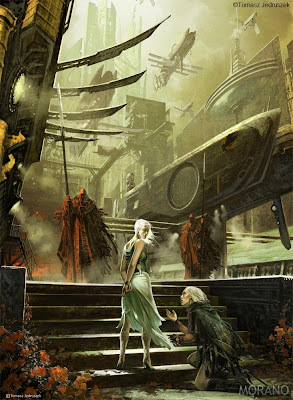 I'll see World of Fantasy Art through this blog. I'm very exciting now. Oh geat. The art work is stunning. If I had 1% of that talent I'd be ultra happy, amazing work!